BETHESDA, MD. 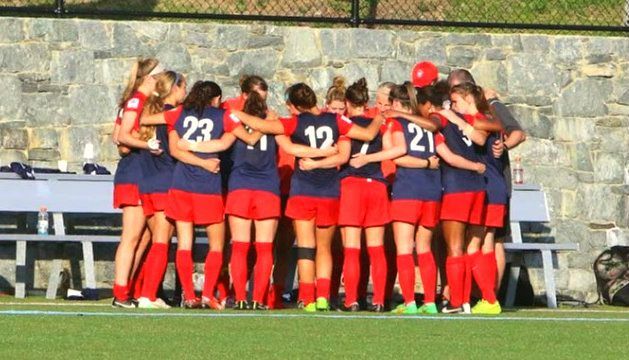 – The Washington Spirit Reserves, coached by Kati Jo Spisak and assisted by JP Sousa, had an outstanding 2015 season, going undefeated during the regular season, 9-0-3, 30 points and topping the Southeastern Conference. The team will travel to Canada this week for the 2015 W-League Championship presented by Nike. Top-seeded Washington will meet No. 4 Quebec Dynamo ARSQ in the first semifinal match on Friday, July 24th, at 5 p.m. ET. The winners will advance to the championship match, set for 2:30 p.m. ET Sunday, July 26th and play the winner of Laval Comets and the Colorado Pride. Both the semifinal and championship games will be streamed live on the W-League YouTube channel. The Washington Spirit Reserves are a young but lethal squad led by their dynamic trio of Midge Pruce with seven goals and two assists on the season, Megan Dougherty-Howard and Imani Dorsey, both finishing with eight goals and two assists for the season. Carson Pickett, Andi Sullivan, Erika Nelson and Meghan Cox anchor the Spirit’s backline only allowing eleven goals on the season. Washington Spirit Reserves will look for these players to step-up throughout the tournament to have a successful run at the championship. Their first opponent Quebec Dynamo ARSQ finished the Northeastern Conference at 8-8-2, 26 points, allowing only twelve goals and scoring twenty-two. The pairing of Quebec forwards Marie Levasseur and Joelle Gosselin scored four goals and three goals, respectively. Several other Quebec players will be offensive threats for the Spirit’s backline in the semifinal match. After a successful regular season, focusing on developing and providing opportunities for top players to develop into full professional athletes the Washington Spirit Reserves will look to stay undefeated and bring home the trophy before players head to their respected Universities. The W-League is the first and longest-standing women’s soccer league in North America. The 2015 W-League campaign will feature 18 teams in three regional conferences playing 12 regular season matches. Featuring current and former international and professional stars, the W-League also provides elite amateurs the opportunity to compete while maintaining their eligibility as college student-athletes. The league is recognized throughout the world for providing superior competition for female players, while offering affordable family entertainment for fans throughout North America.